Last year, my Papa sent me a surprise package of goods, unbeknownst to me. He’s the kind of guy who does that, you know? I opened a nondescript box and out tumbled these curious green objects. What on earth were they? I did some googling and figured out he’d sent me finger limes, a microcitrus from Australia (not a true lime at all, actually). This wild fruit has only been cultivated commercially in the last couple decades and only within the last few years have they really come to the U.S. In the last couple years, a farm in California has been growing and selling them from trees they imported. And friends? They are delicious! They taste a bit like a lemon-lime combo with a slightly floral note. And they’re fun as hell. I used up my last batch straight away by putting them on Thai food and in yogurt, and then I made a batch of finger lime curd. It’s finger lime season again (typically runs from September through February, in the U.S.), so I told some coworkers about them. We got the fine folks at Shanley Farms to send us a couple packages to review on the blog, and I was positively swimming in these gherkin-lookin’ cuties. After giving away handful after handful for friends to experiment, I still had plenty to make a batch of finger lime curd. I improved on the version I made last time by waiting to add the vesicles till the curd was cool (in the hot curd, they burst). Today, we enjoyed it at the office spread on graham crackers, which makes a snack reminiscent of key lime pie, but I think I prefer the curd spread on a slice of soft baguette so you can really experience those bursty little “citrus caviar.” You can buy packages of finger limes from Shanley Farms online, and though they seem expensive, one small packet is enough to make this curd or garnish several dishes. Food experiments, friends! 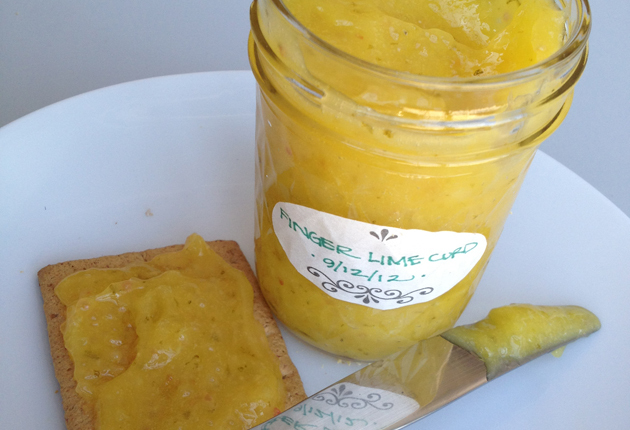 With a fine microplane grater, grate 1 teaspoon zest from the finger limes. In a saucepan, whisk together eggs, sugar, zest, and lime juice. Cook over low, whisking frequently, until thickened, 20 to 22 minutes. Stir in butter and transfer to a glass bowl. Cover with plastic, pressing plastic directly against curd. Refrigerate 1 hour. 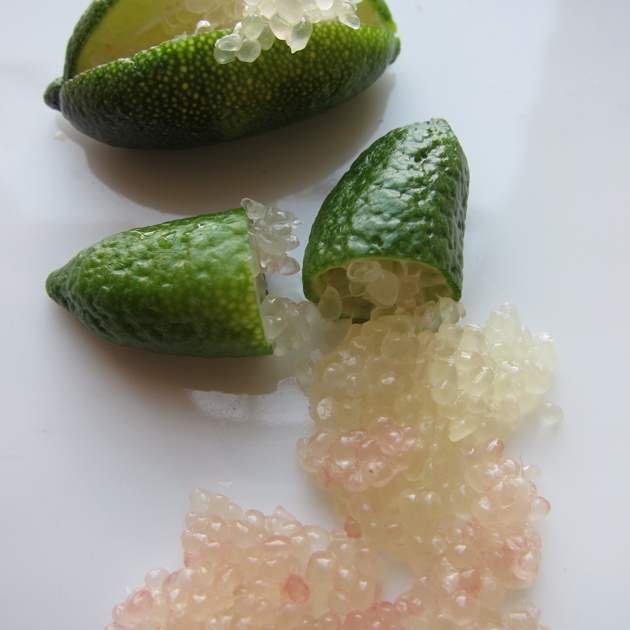 Stir in finger lime vesicles and refrigerate (up to 1 week). Serve on crackers, baguette, cookies, ice cream, or stirred into yogurt. Note: You can make this curd with regular limes, too. Just increase the zest to 2 teaspoons and use 4 ounces lime juice.